Who's got the thyme? : Big Red Pot of Yum! Big Red Pot of Yum! Sometimes when I'm feeling really under the weather, (that kind of sick where you just can't get off the couch and you wish for the old days when your Mom or Gram made you food and covered you with blankets) I wish someone would just hand me a warm bowl of something yummy (preferably involving cheese). Well I'm not sick or under the weather but I believe I know what I want that bowl to contain the next time I am! 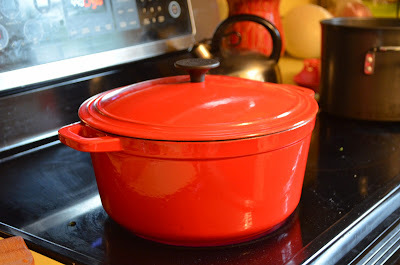 It has been a busy week already at our house so last night I busted out (my favorite) big red pot for an easy one pot meal that had to be ready to go when everyone got home. 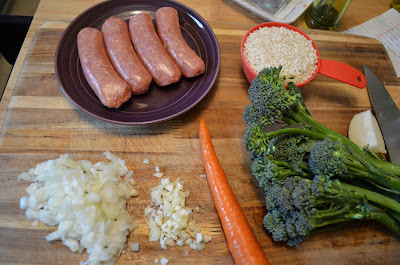 Out of my trusty Food TV Magazine I tried Sausage and Broccolini Risotto for the second time. The first time was a bust but due to my own error, I will do my best to make sure you do not make the same mistake I did. ﻿I tried this recipe this winter but was unfamiliar with broccolini. Since the store I was in didn't have any such vegetable by any such name, I figured I would substitute broccoli rabe. No good. That stuff is totally bitter and no one liked this dinner at all. You could tell though, between the bitter bites that this was worth another try. 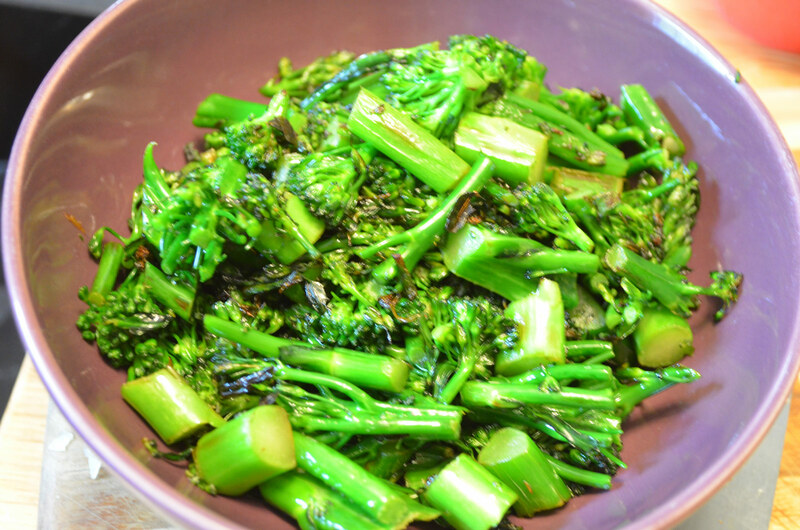 Broccolini (as I just learned moments ago) is actually a hybrid of broccoli and Chinese chard (no shocker there, I do love the chard) and it's sweet not bitter. Before getting started I like to get prepped to avoid any last minute scrambling while the butter burns (true story, forgot I started the butter, was chopping onions and helping with homework-had to start anew because burnt butter is not yummy). 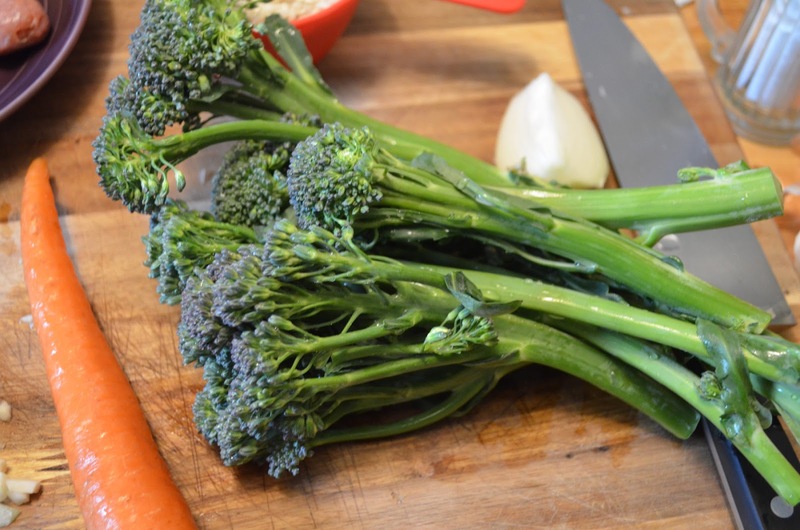 So you chop your broccolini, some onion, a carrot and some garlic. Get out the risotto (arborio Rice) and your sausage. When you're ready melt some butter in your pot and stir fry the broccolini for about 4 min. When it's just tender, remove it from to pot to a plate or bowl. 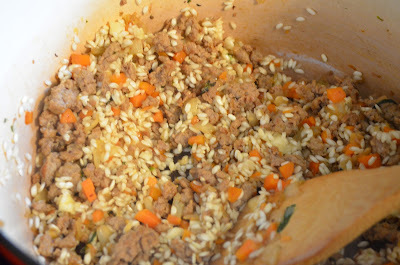 Next you'll add the sausage (removed from casing), onion and carrot to the pot and cook until browned, about 5 min. Then you will add the garlic and the arborio rice and cook, stirring for about a minute. Now is a good time to mention that this recipe calls for sweet Italian sausage but you can save a boatload of calories by using mild turkey sausage, tastes just as good, less greasy. Next you'll add a little white wine. It only calls for 1/3 cup so get something you like! We're not big white wine drinkers, so we go for cheap. 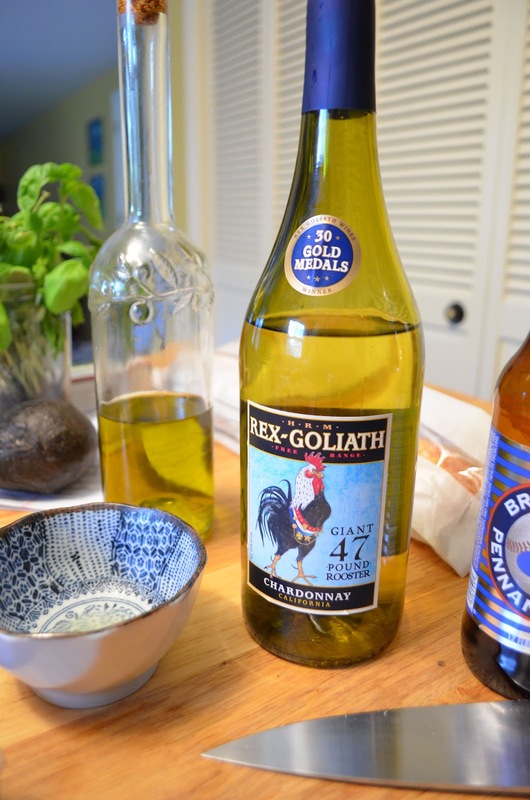 After the wine evaporates you will add 1 can chicken broth and 1 can diced tomatoes and bring to a boil. Then you'll put it in a pre-heated oven for about 15 min. 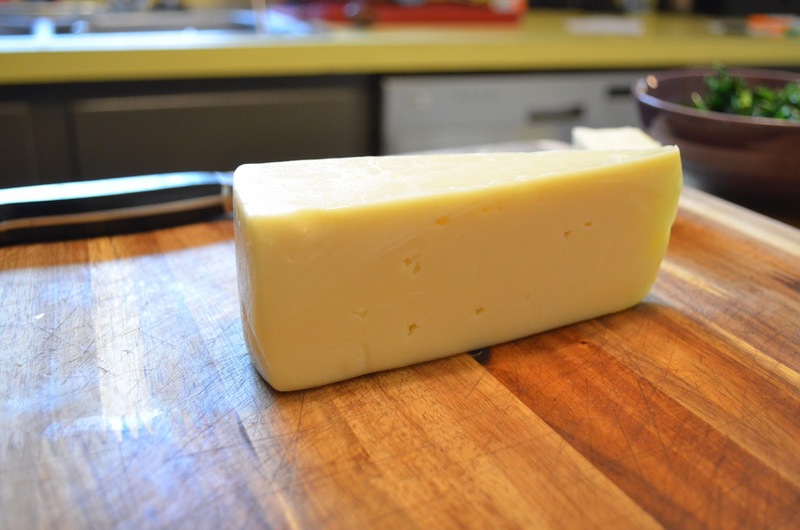 While that's in the oven, shred one cup of fontina cheese (O.M.G. I love fontina cheese). Good news! You'll have about half (or more) of this hunk left to use in something else (yay!). Now is also a good time to address those pressing homework questions, games of hangman and what not. When the pot comes out of the oven you stir in a little more butter, the cooked broccolini and the cheese. Now my friends, it is time to eat! This is definitely on my list of favorites! 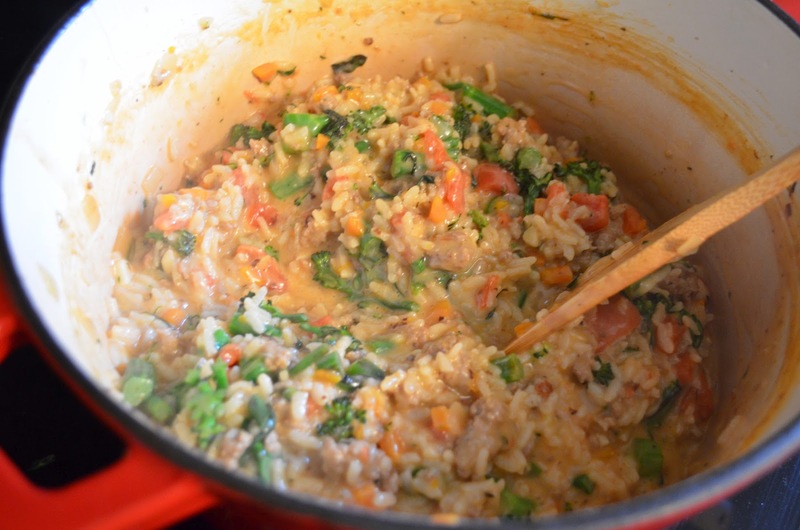 And you can't beat risotto that doesn't need constant stirring! Serve with a salad and you're good to go. Pre-heat the oven to 450. Heat 1 tbs butter in an oven proof dutch oven over medium high heat. Add the broccolini and stir-fry until just tender, about 4 min. Transfer to a plate with a slotted spoon. Add the sausage, onion and carrot to the pot (I added a touch of olive oil because the meat was very lean) and cook stirring, breaking up the meat until browned, about 5 min. Add the rice and garlic and cook stirring 1 more min. Add white wine to the pot and cook until evaporated. Add chicken broth, tomatoes and 1 cup water; cover and bring to a boil. Transfer the pot to the oven and bake until the rice is tender, about 15 min. Remove the pot from the oven. Vigorously stir in the remaining 2 tbs butter and cheese until creamy, stir in the broccolini and serve. 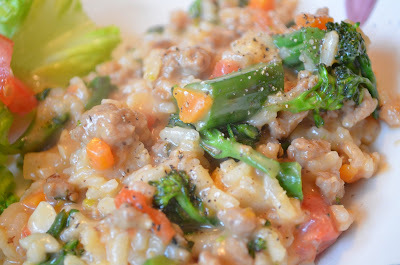 I did my own calorie count on this because I used turkey sausage instead of pork. Also the magazine calls this 4 servings, I call that a bit much. So with my sausage and 5 generous servings this comes out to be 402 calories per serving. Not bad for a bowl of cheesy goodness. Mmm- sounds fabulous! I LOVE risotto. Def. going to try this one.